It&apos;s April now, and motivation to keep up with my New Years resolutions is running thin. I have had a hard time staying healthy despite daily gym time, so Juicebox and The Soup Peddler have been a lifesaver for me. Whether you&apos;re looking to reach a health goal or just aiming for a more conscious dining lifestyle, The Soup Peddler has many excellent and healthy soup and juice options! The store offers daily selections of freshly made soup, ranging from tomato-basil to chili. The Green Goddess is their vegan, dairy-free, and gluten-free mainstay with broccoli, spinach, and celery in a brown rice broth- it&apos;s the perfect healthy lunch. If you&apos;re the kind of person that prepares meals in advance, The Soup Peddler will even deliver soup to you. To do this, check out the menu for the upcoming week online, and order your favorite choices. Your order will arrive on the first day of that week, and you can have your soup without even stepping outside of your door. For those of you looking for even cleaner eating, Soup Peddler&apos;s Juicebox has you covered. For a refreshing swig, grab a Beet Generation which is made with pineapple, carrots, beets, ginger and lemon. You can even have some of these juices delivered for the week with your soup. Other options include smoothies, which are great for a protein fix post-workout or tourist hike. The Rip-Torn and Voltron both have high protein content and are tasty to bet. You can also add coffee, protein or immunity boosters to any of your juices or smoothies. 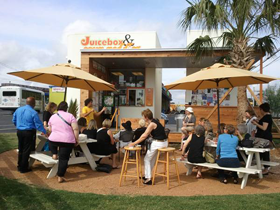 Whether you want something hot or cold, hearty or healthy while you&apos;re traveling around town, Juicebox and The Soup Peddler is the place to go in Austin! Check them out on South Lamar or West Mary on the corner of South First Street.